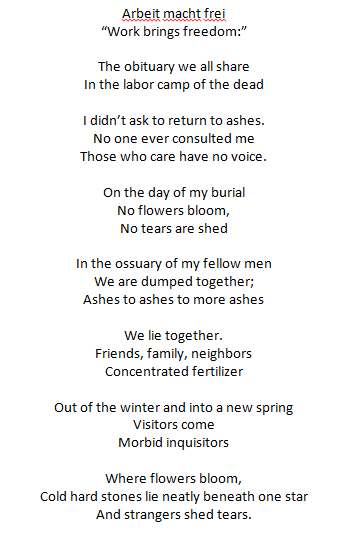 A couple of months ago I had to delete one of my blog posts: “A Tribute to Tante Rosa.” I had linked the post to the Shoah Foundation at the University of Southern California because I would not have been able to write my tribute without access to their research on the Holocaust. Unfortunately, the Shoah Foundation attracted malicious hackers, and my blog post had to be removed in order to protect the rest of my web site. Why is it that tragedy attracts malevolence? Today I am rewriting my tribute to Tante Rosa (Rosa Daniel), since I did not save it in any other form. I will not be linking my site again to theirs, but I do recommend looking up USC Shoah Foundation. It does a great job at personalizing genocide, something we should all make personal. If we can’t relate to it, we have no reason to put an end to it. Tante Rosa’s story has been intrinsically connected to my appetite for genealogy. I truly believe that we are all products of our past, and that those who came before us help to define who we are today. For example, my mom tells me that my brother walks with the same swagger that my grandfather had; and I know that my daughter suffers from the same anxiety and depression that I believe came from Rosa’s sister: my grandmother (Josephine Daniel). My mother and I have it too. As I learn more about each of my ancestors, I begin to understand how customs, traditions, physical characteristics, and yes, behaviors, are kept alive in myself. I learned about my Jewish predecessors as a young girl, and I wondered about the behaviors not only of Nazi sympathizers, but of the Jews themselves. I wondered why people took their fear of differences so far that they felt those who were different had to die. And as I watched my own family, I began to see repeated behaviors that mirrored behaviors of those from certain races. I have come to understand that these are not necessarily “racial” behaviors, but circumstantial responses that have been passed down from one generation to the next. When it comes to my grandmother’s side of the family, I speak specifically of pathological illnesses including (and not limited to) depression, anxiety, and paranoia that are quite often evident in surviving European Jews and their families. The tragedy has been kept alive in ourselves. If we don’t understand it, how can we “fix” it? In telling Rosa’s story, I hope that I am adding a human connection to history. This isn’t just the story of Rosa Daniels, it is my story. Grandma left all four of her sisters behind in Austria. My Daniel great-grandfather and great-grandmother had passed from this life by the time Austria was annexed to Germany (Anschluss). Two of grandma’s sisters married influential men who were able to keep them safe, but Tante Leni (Helen Daniel Boe) and Tante Rosa were left alone in the town of Wimpassing im Schwarzatale, where they were the only Jews. Grandma begged Rosa and Leni to join her in the United States, but Rosa felt that she would be able to save the family’s property (a bakery and store). 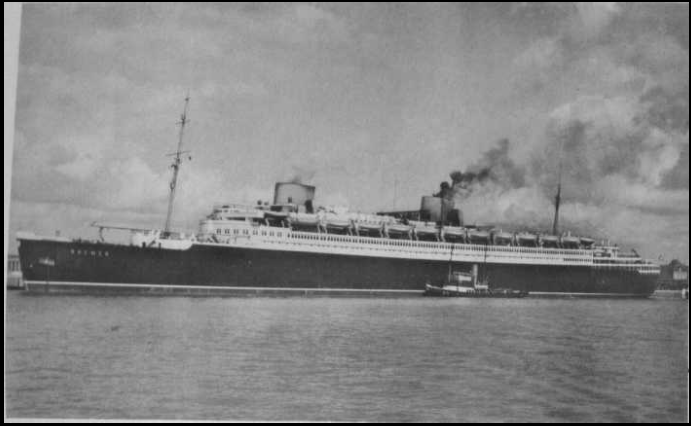 Bremen–the ship that carried Tante Leni to safety in August of 1939. Grandma scraped up the funds to get both sisters out of Austria, but Leni came alone, and I am told she was able to get out just before borders were closed to Jewish migration out of the country. Three years after Leni left, the property was in the hands of the Nazis, and Rosa was gone. I am not sure why, but Grandma believed that Rosa died in Auschwitz. From Grandma’s verbal history passed on by my parents, and information from the Shoah Foundation and Yad Vashem, we have been able to piece together the truth: Tante Rosa did die at the hands of the Nazis, but not in a concentration camp. As the story was told to me, Rosa took paperwork from Grandma into Vienna in her determination to save the family property from Nazi occupation. The paperwork showed that Grandma was an American citizen with interest in the property. Rosa believed that property owned by a U.S. citizen would be exempt from seizure, so she took it to Vienna to have the property registered as American. This part of the story was passed on by word of mouth. I have since discovered that Rosa probably did not go willingly. 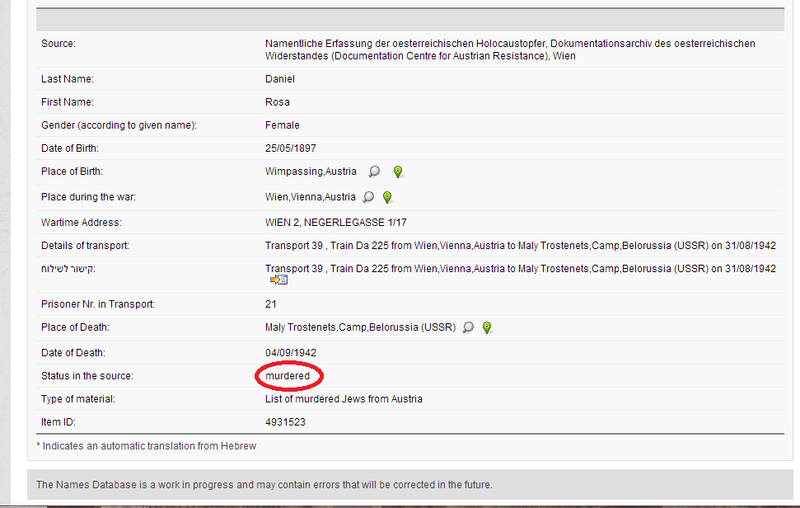 Yad Vashem’s report of Tante Rosa’s transport says that “Jews that had been selected for this transport had to report to the assembly camp in a former school situated in the 2nd Viennese district, Kleine Sperlgasse 2 … On arrival at the school grounds, Jewish deportees had to hand over the keys to their homes” (Yad Vashem). Clearly Rosa stayed in contact with Grandma up until the days before her death, otherwise Grandma would not have known that Rosa was going to Vienna with her paperwork. After her trip to Vienna, Rosa disappeared, and Grandma never heard from her again. Grandma died long before the invent of the internet, so she never knew what actually happened. The content of the eye-witness report sounds legitimate due to the date of the arrival of Transport 39: September 4–the end of summer. I remember learning that many Jews died during transport due to heat exhaustion from overpacked trains on warm days. Rosa boarded a cattle car on September 2. The train was filled with at least 1000 people. It is very likely that people died in large numbers during the two days they were on the train. It is not likely, though, that the report is accurate, as there were no known survivors of Maly Trostenets. Maly Trostenets was not a work camp or even a concentration camp. This Belorussian camp made no pretenses at freedom or survival. It was simply a death camp. 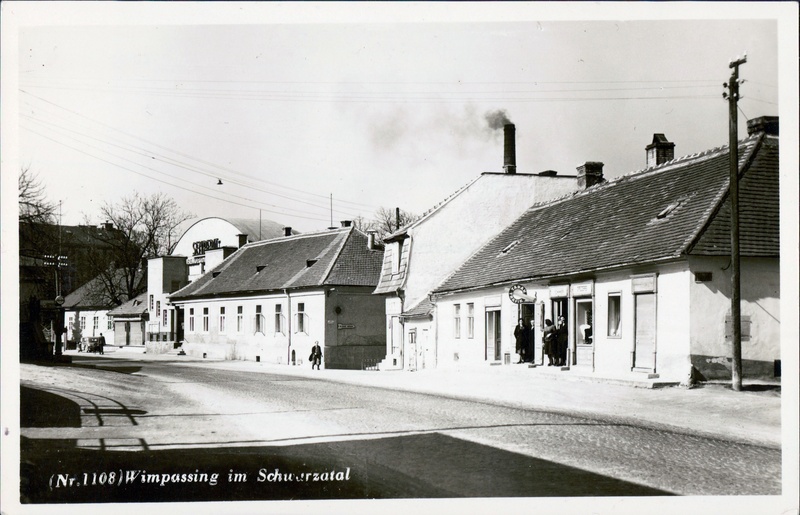 The only prisoners in the camp were those who were forced into slave labor–perforning camp duties such as maintaining mobile gas chambers and burying victims. In order to save gasoline (and time), the trains were diverted to a seldom-used sidetrack that led from Kolodishchi to an improvised platform in the vicinity of Maly Trostenets. 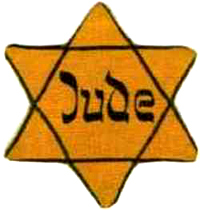 Members of the security service (SD) rounded up the Jews in a meadow close to the Maly Trostenets camp, where they were quickly robbed of their last remaining belongings. The SD-men conducted a selection in which they chose 20 – 50 young men who were then sent to various kinds of forced labor in the camp. The remaining Jews on this transport were brought directly to open pits in Blagovshchina forest, where they were shot to death by SD men. So now we know. At least we know enough. Details are unnecessary, and photos are incredibly graphic. I am sure that Grandma saw enough on newsreels, and did plenty of imagining. I wish someone could have been there to reassure her that Rosa did not suffer for long. Perhaps it would have eased my grandmother’s own suffering. In the summer of 2001, I visited Germany and Austria. While I was in Germany, I went to Dachau. 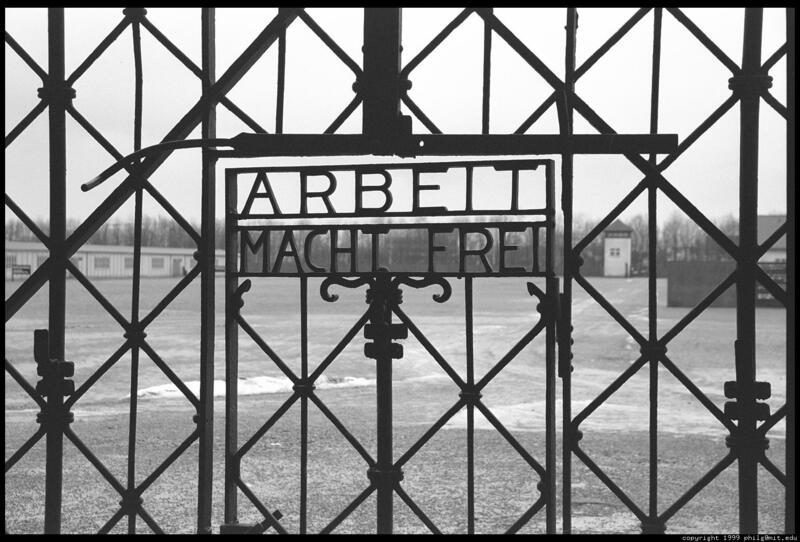 The gates to the camp are emblazoned with the slogan, Arbeit Macht Frei (work brings freedom). It’s an ironic falsehood leading detainees to believe that hard work would result in their release. Of course we know that was not so.